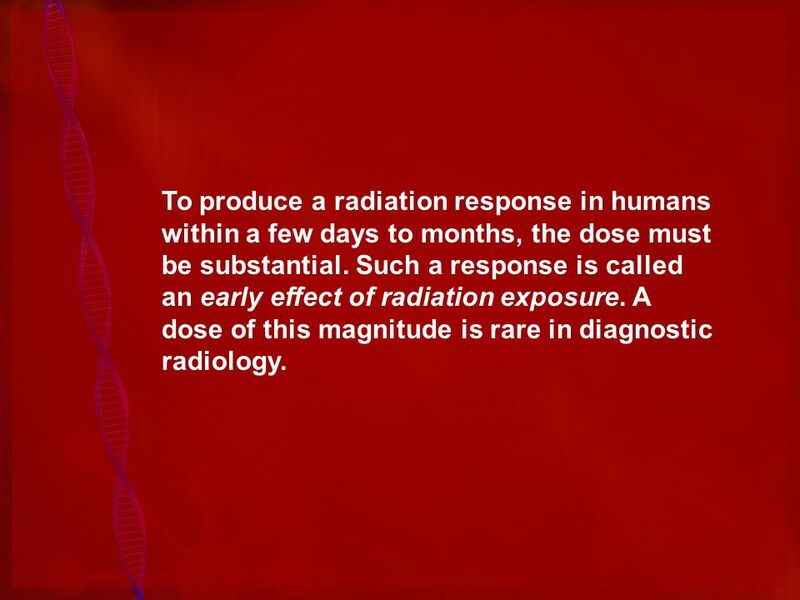 4 To produce a radiation response in humans within a few days to months, the dose must be substantial. Such a response is called an early effect of radiation exposure. A dose of this magnitude is rare in diagnostic radiology. 7 Nonstochastic effects are characterized by a threshold dose below which they do not occur. In other words, nonstochastic effects have a clear relationship between the exposure and the effect. In addition, the magnitude of the effect is directly proportional to the size of the dose. Nonstochastic effects typically result when very large dosages of radiation are received in a short amount of time. These effects will often be evident within hours or days. 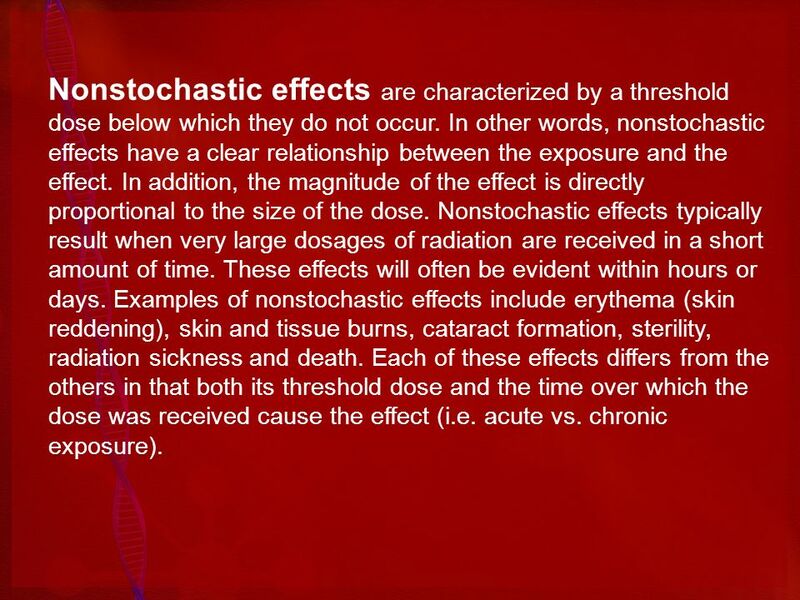 Examples of nonstochastic effects include erythema (skin reddening), skin and tissue burns, cataract formation, sterility, radiation sickness and death. Each of these effects differs from the others in that both its threshold dose and the time over which the dose was received cause the effect (i.e. acute vs. chronic exposure). 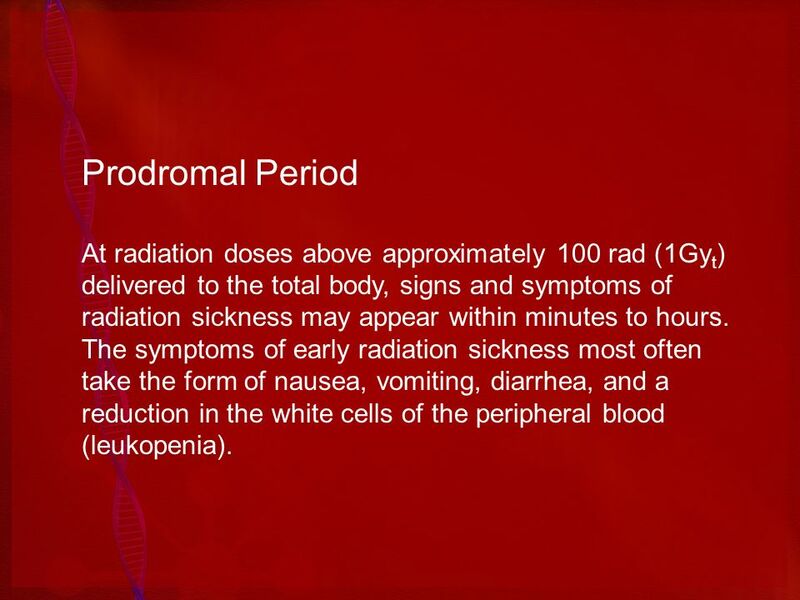 8 Prodromal Period At radiation doses above approximately 100 rad (1Gyt) delivered to the total body, signs and symptoms of radiation sickness may appear within minutes to hours. The symptoms of early radiation sickness most often take the form of nausea, vomiting, diarrhea, and a reduction in the white cells of the peripheral blood (leukopenia). 9 Latent Period After the period of initial radiation sickness, a period of apparent well-being occurs, which is called the latent period. The latent period extends from hours or less (at doses in excess of 5000 rad) to weeks (at doses from 100 to 500 rad). 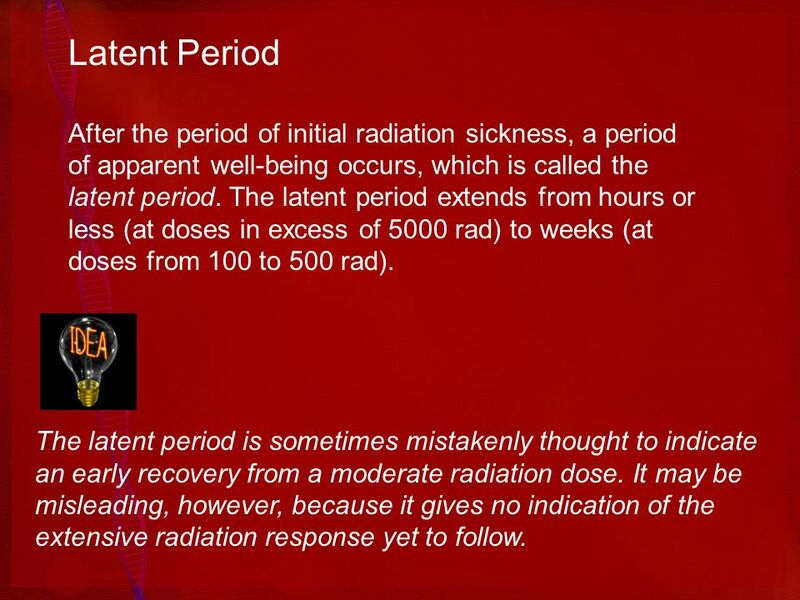 The latent period is sometimes mistakenly thought to indicate an early recovery from a moderate radiation dose. It may be misleading, however, because it gives no indication of the extensive radiation response yet to follow. 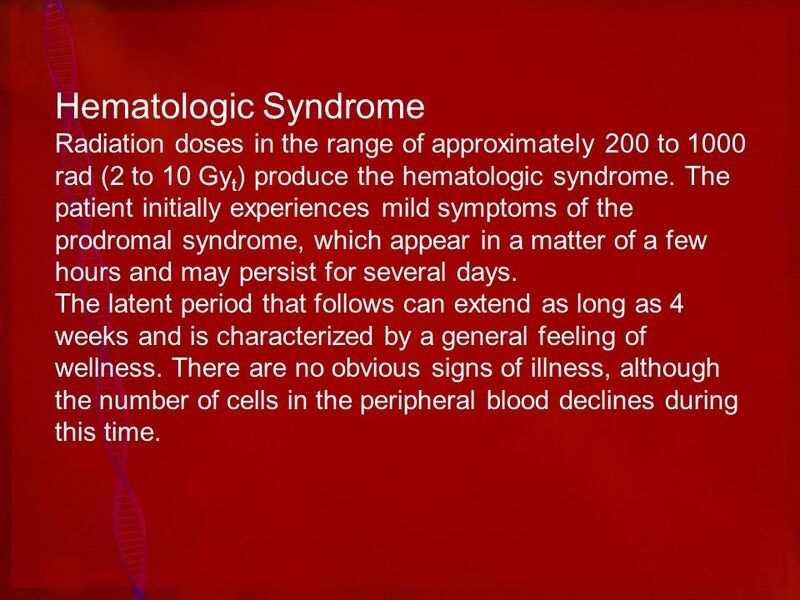 10 Hematologic Syndrome Radiation doses in the range of approximately 200 to 1000 rad (2 to 10 Gyt) produce the hematologic syndrome. The patient initially experiences mild symptoms of the prodromal syndrome, which appear in a matter of a few hours and may persist for several days. The latent period that follows can extend as long as 4 weeks and is characterized by a general feeling of wellness. There are no obvious signs of illness, although the number of cells in the peripheral blood declines during this time. 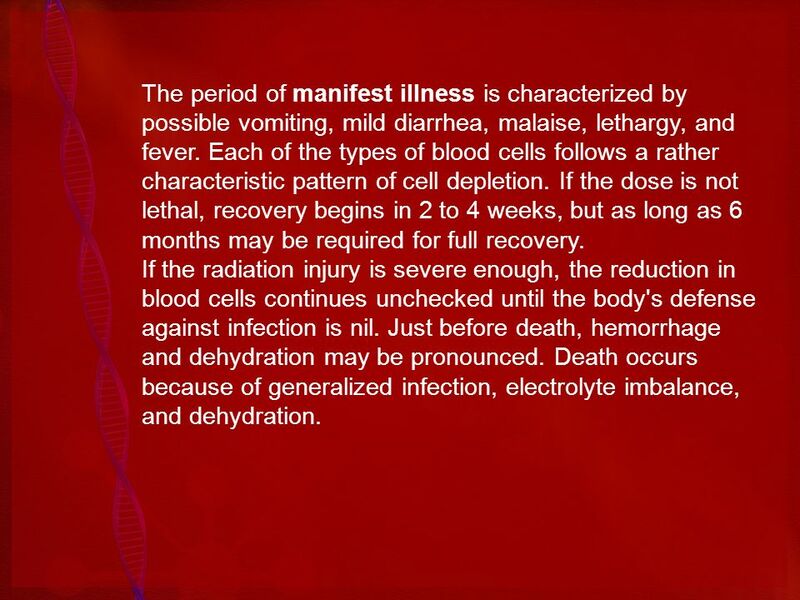 11 The period of manifest illness is characterized by possible vomiting, mild diarrhea, malaise, lethargy, and fever. Each of the types of blood cells follows a rather characteristic pattern of cell depletion. If the dose is not lethal, recovery begins in 2 to 4 weeks, but as long as 6 months may be required for full recovery. 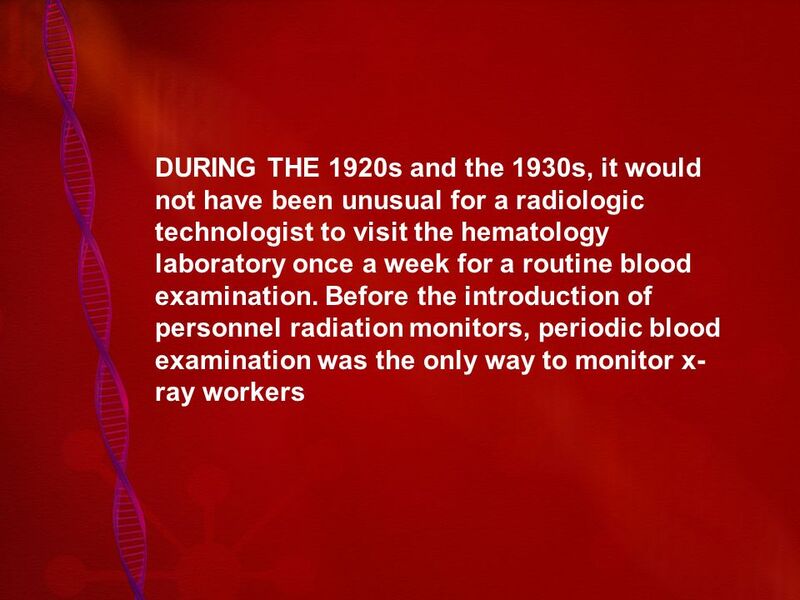 If the radiation injury is severe enough, the reduction in blood cells continues unchecked until the body's defense against infection is nil. Just before death, hemorrhage and dehydration may be pronounced. Death occurs because of generalized infection, electrolyte imbalance, and dehydration. 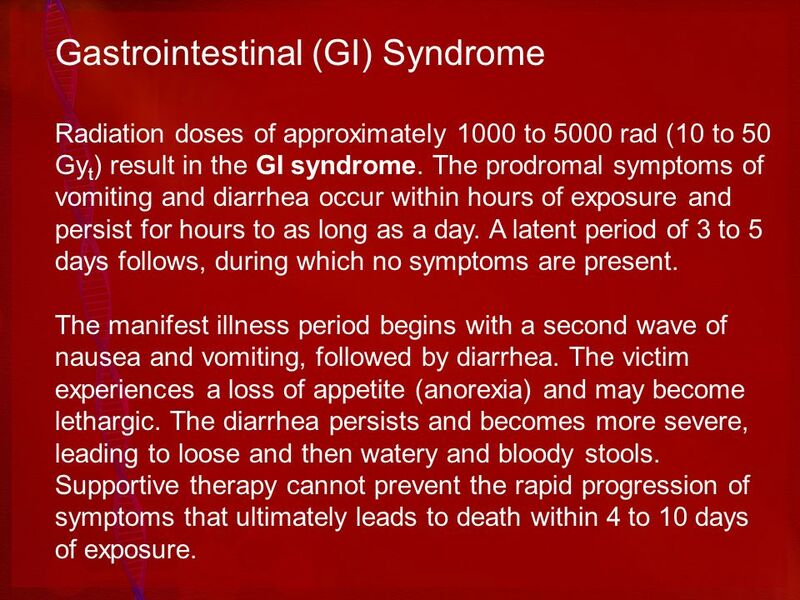 Radiation doses of approximately 1000 to 5000 rad (10 to 50 Gyt) result in the GI syndrome. The prodromal symptoms of vomiting and diarrhea occur within hours of exposure and persist for hours to as long as a day. A latent period of 3 to 5 days follows, during which no symptoms are present. The manifest illness period begins with a second wave of nausea and vomiting, followed by diarrhea. The victim experiences a loss of appetite (anorexia) and may become lethargic. The diarrhea persists and becomes more severe, leading to loose and then watery and bloody stools. Supportive therapy cannot prevent the rapid progression of symptoms that ultimately leads to death within 4 to 10 days of exposure. 13 Intestinal cells are normally in a rapid state of proliferation and are continuously being replaced by new cells. The turnover time for this cell renewal system in a normal person is 3 to 5 days. 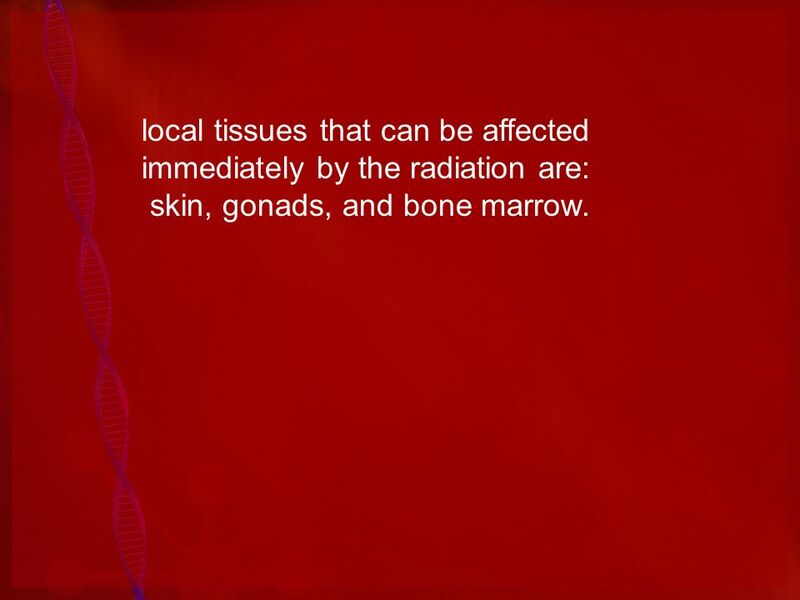 Radiation exposure kills the most sensitive cells—stem cells; this controls the length of time until death. When the intestinal lining is completely denuded of functional cells, fluids pass uncontrollably across the intestinal membrane, electrolyte balance is destroyed, and conditions promote infection. 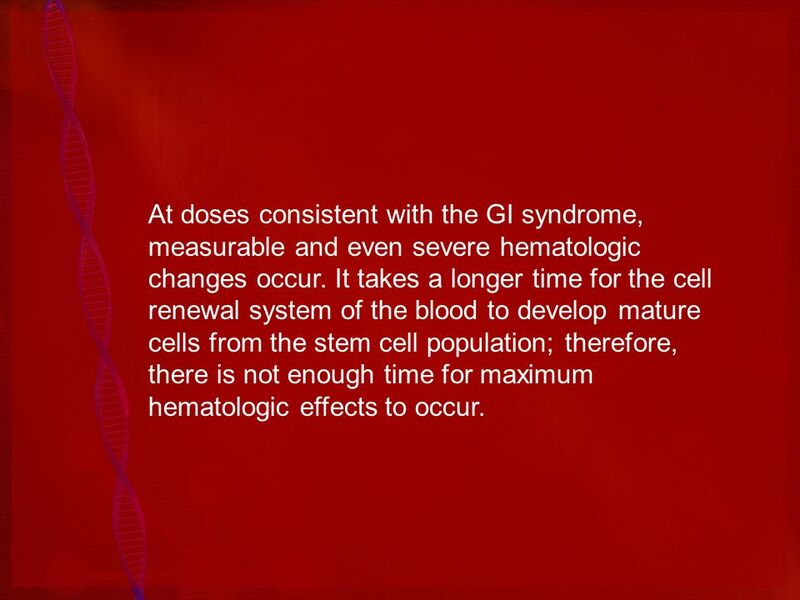 14 At doses consistent with the GI syndrome, measurable and even severe hematologic changes occur. 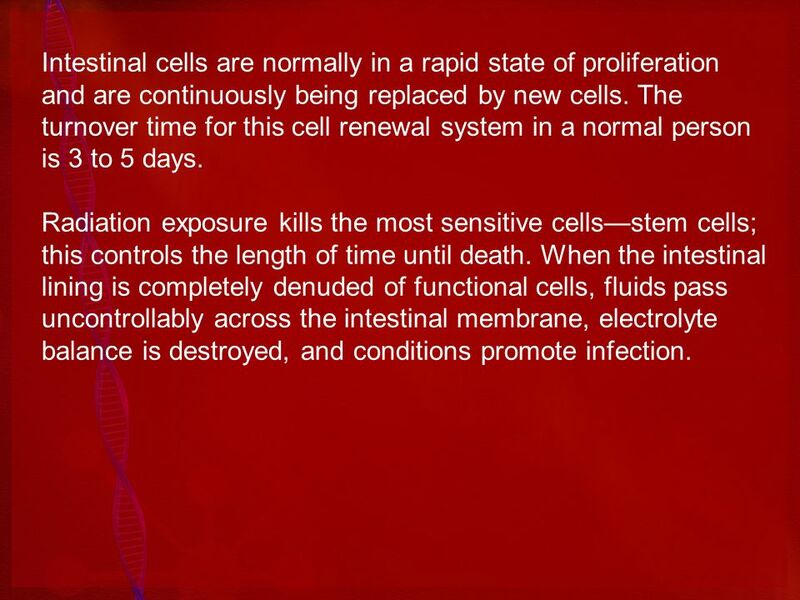 It takes a longer time for the cell renewal system of the blood to develop mature cells from the stem cell population; therefore, there is not enough time for maximum hematologic effects to occur. 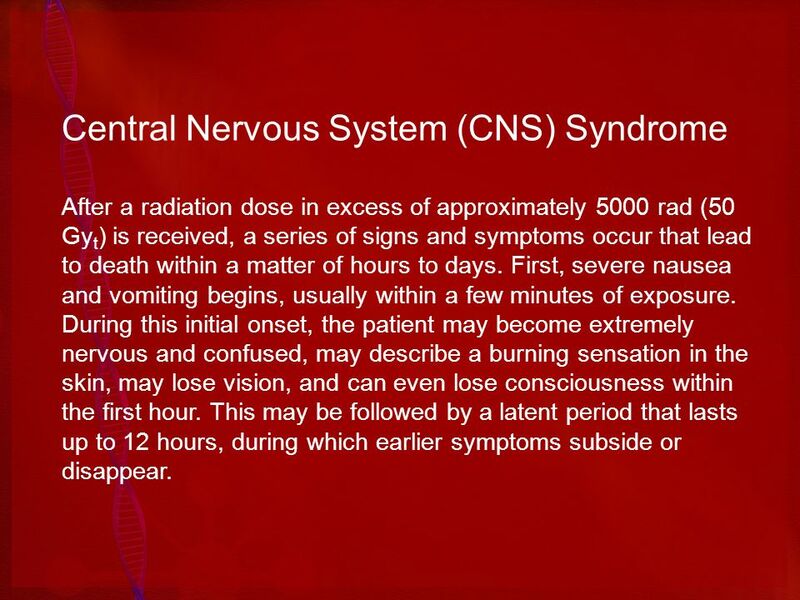 After a radiation dose in excess of approximately 5000 rad (50 Gyt) is received, a series of signs and symptoms occur that lead to death within a matter of hours to days. First, severe nausea and vomiting begins, usually within a few minutes of exposure. During this initial onset, the patient may become extremely nervous and confused, may describe a burning sensation in the skin, may lose vision, and can even lose consciousness within the first hour. This may be followed by a latent period that lasts up to 12 hours, during which earlier symptoms subside or disappear. 16 The latent period is followed by the period of manifest illness, during which symptoms of the prodromal stage return but are more severe. The person becomes disoriented; loses muscle coordination; has difficulty breathing; may go into convulsive seizures; experiences loss of equilibrium, ataxia, and lethargy; lapses into a coma; and dies. 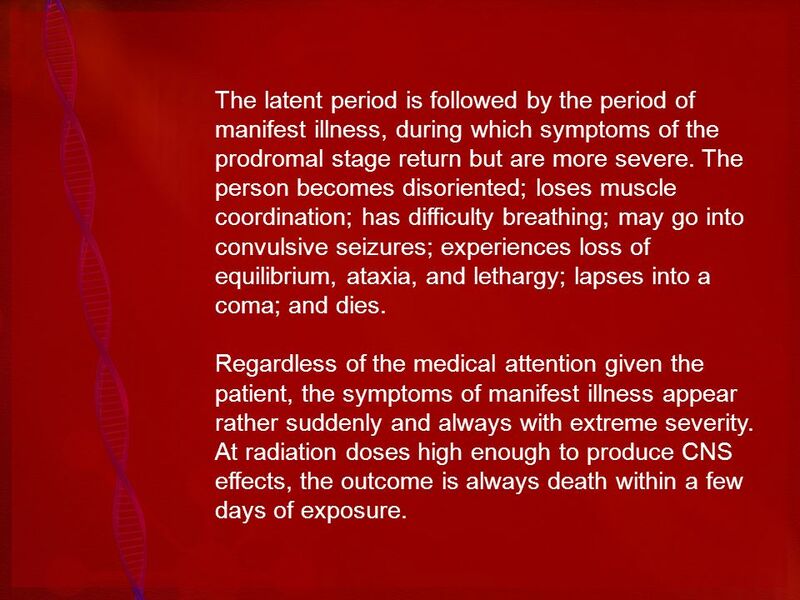 Regardless of the medical attention given the patient, the symptoms of manifest illness appear rather suddenly and always with extreme severity. 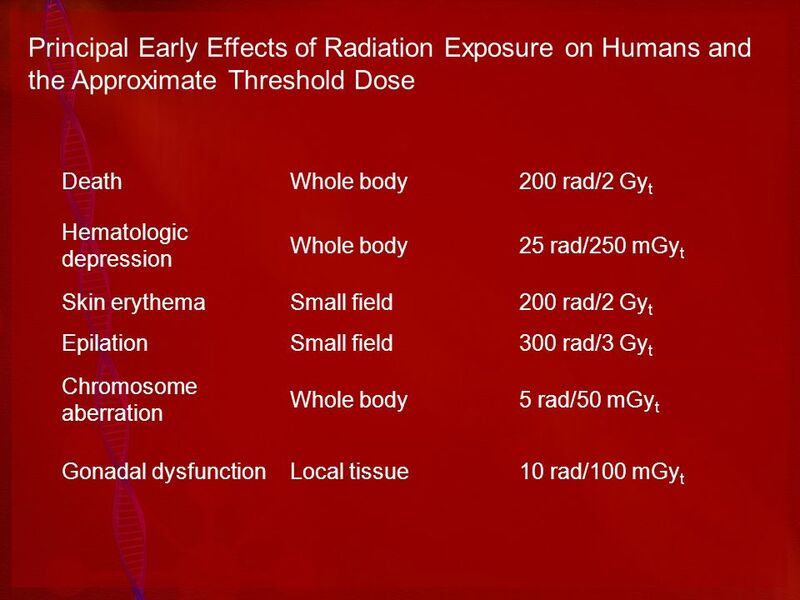 At radiation doses high enough to produce CNS effects, the outcome is always death within a few days of exposure. 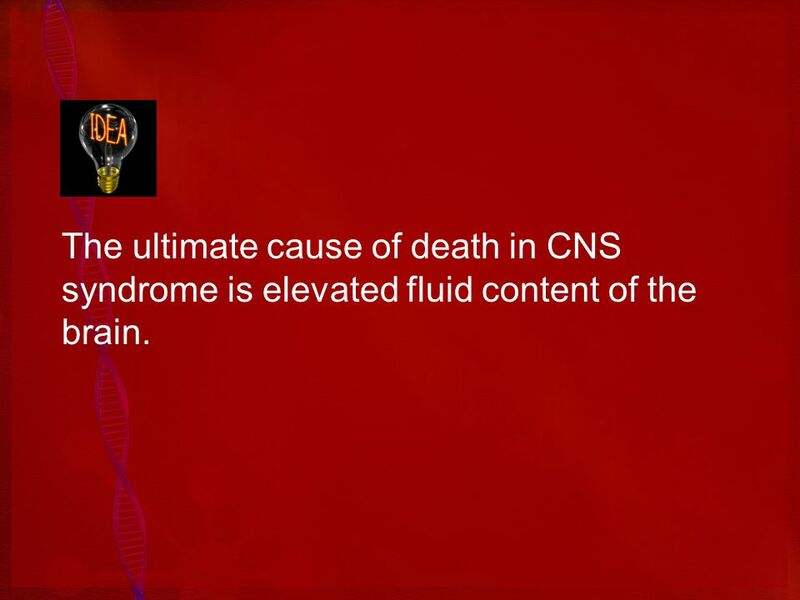 17 The ultimate cause of death in CNS syndrome is elevated fluid content of the brain. 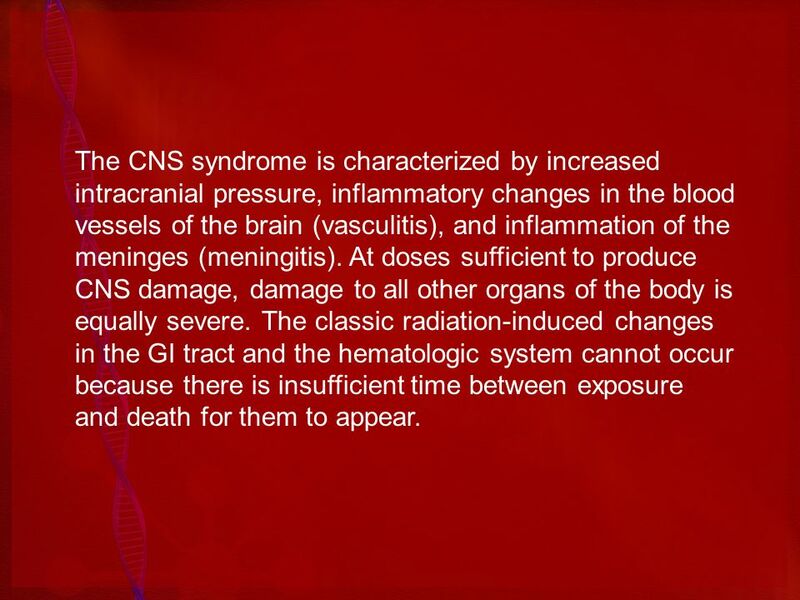 18 The CNS syndrome is characterized by increased intracranial pressure, inflammatory changes in the blood vessels of the brain (vasculitis), and inflammation of the meninges (meningitis). At doses sufficient to produce CNS damage, damage to all other organs of the body is equally severe. 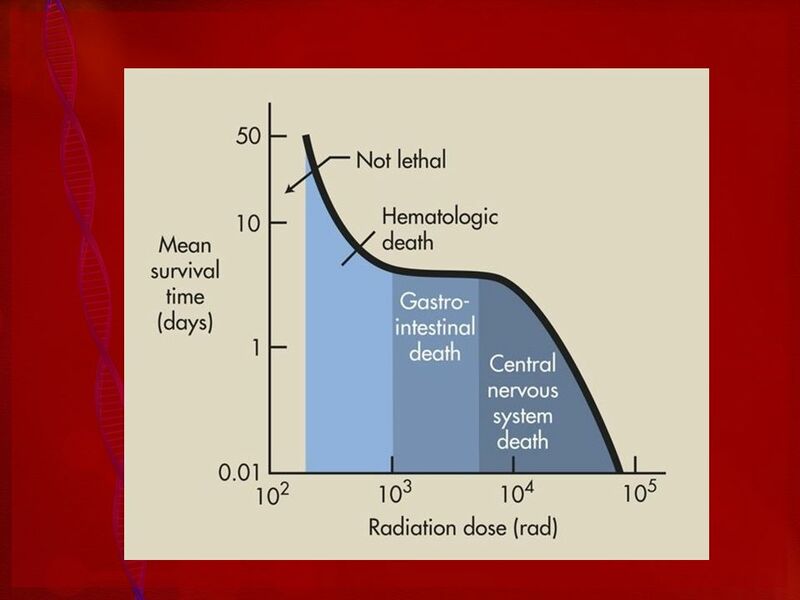 The classic radiation-induced changes in the GI tract and the hematologic system cannot occur because there is insufficient time between exposure and death for them to appear. 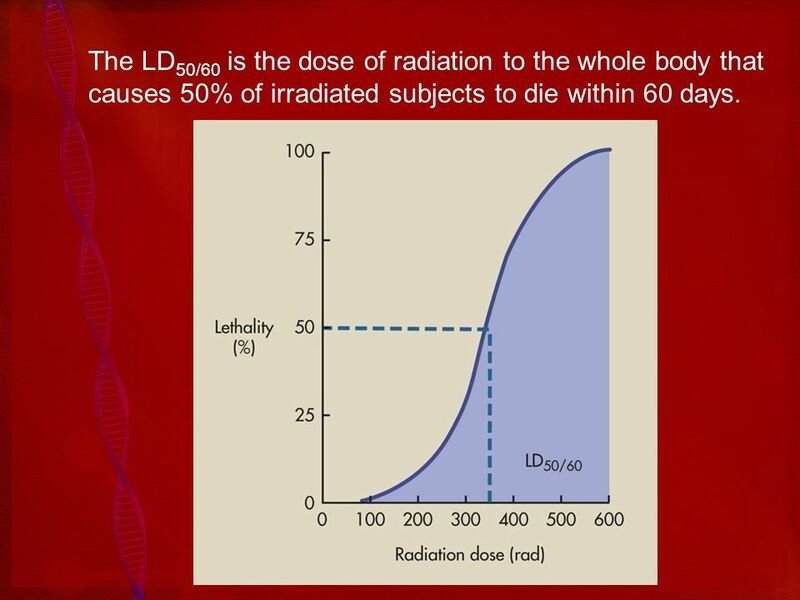 19 The LD50/60 is the dose of radiation to the whole body that causes 50% of irradiated subjects to die within 60 days. 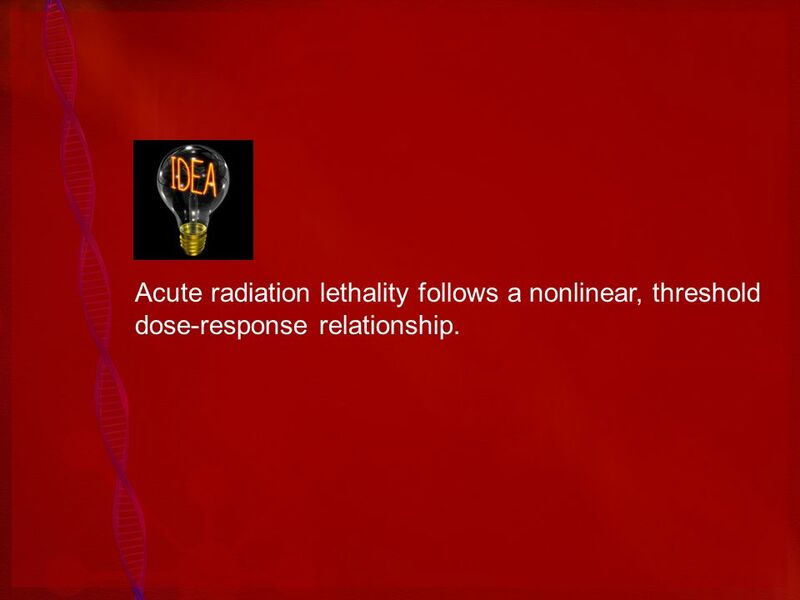 20 Acute radiation lethality follows a nonlinear, threshold dose-response relationship. 21 At the lower dose of approximately 100 rad (1 Gyt), no one is expected to die. 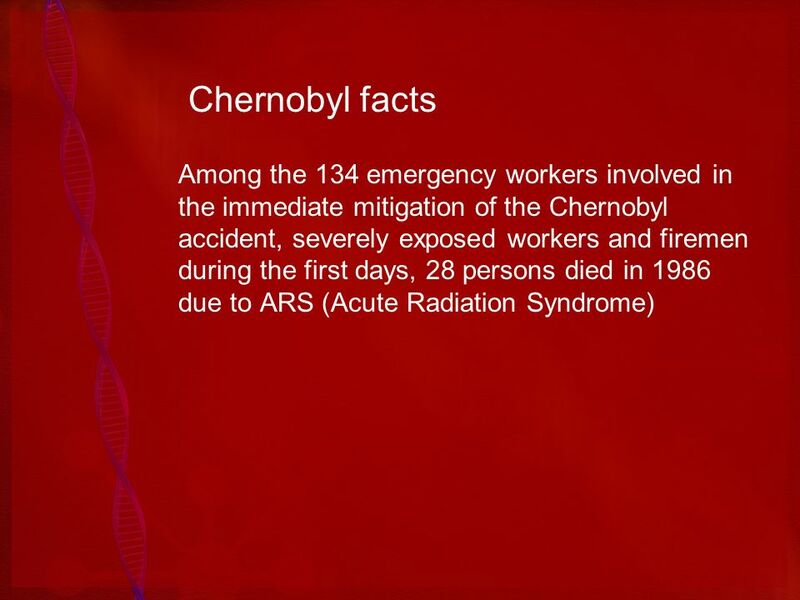 Above approximately 600 rad (6 Gyt), all those irradiated die unless vigorous medical support is available. 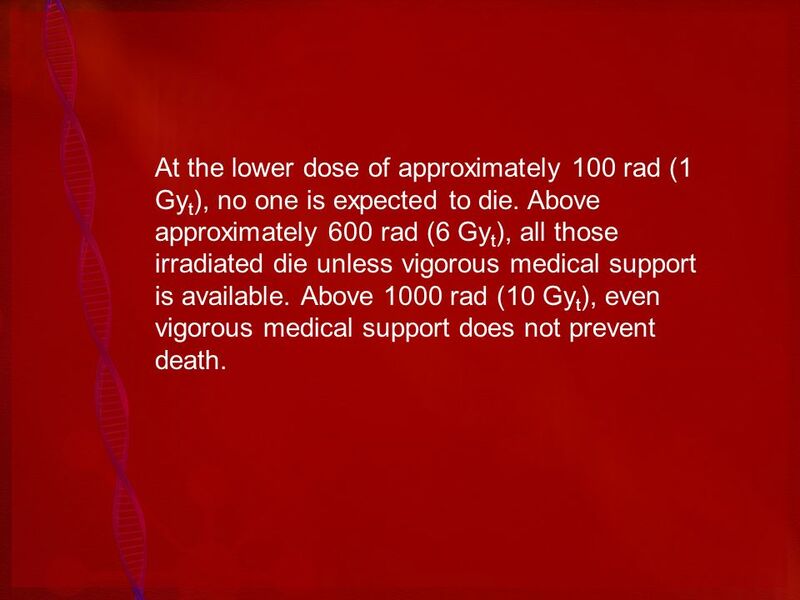 Above 1000 rad (10 Gyt), even vigorous medical support does not prevent death. 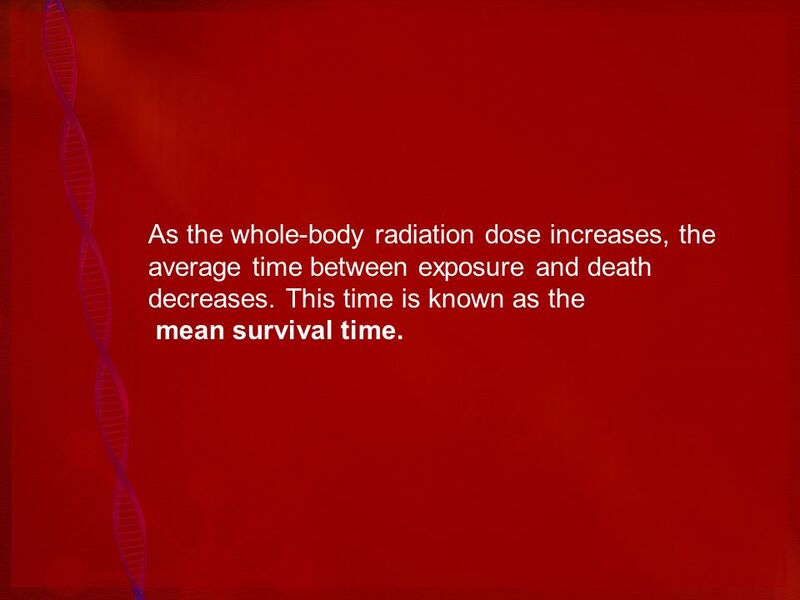 22 As the whole-body radiation dose increases, the average time between exposure and death decreases. This time is known as the mean survival time. 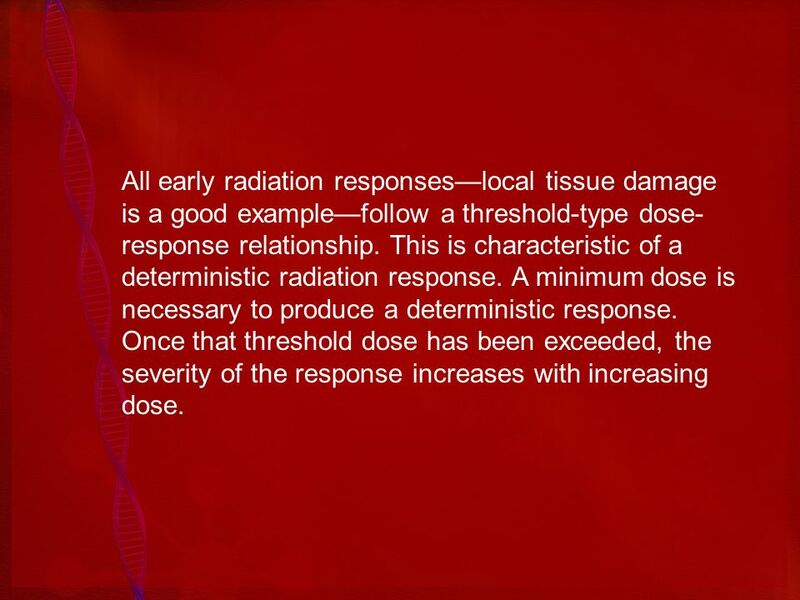 23 All early radiation responses—local tissue damage is a good example—follow a threshold-type dose-response relationship. This is characteristic of a deterministic radiation response. A minimum dose is necessary to produce a deterministic response. 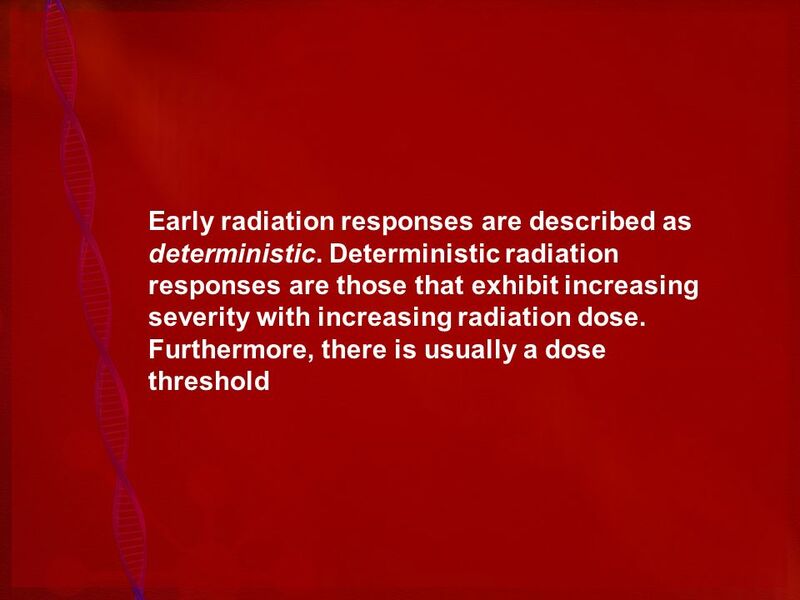 Once that threshold dose has been exceeded, the severity of the response increases with increasing dose. skin, gonads, and bone marrow. 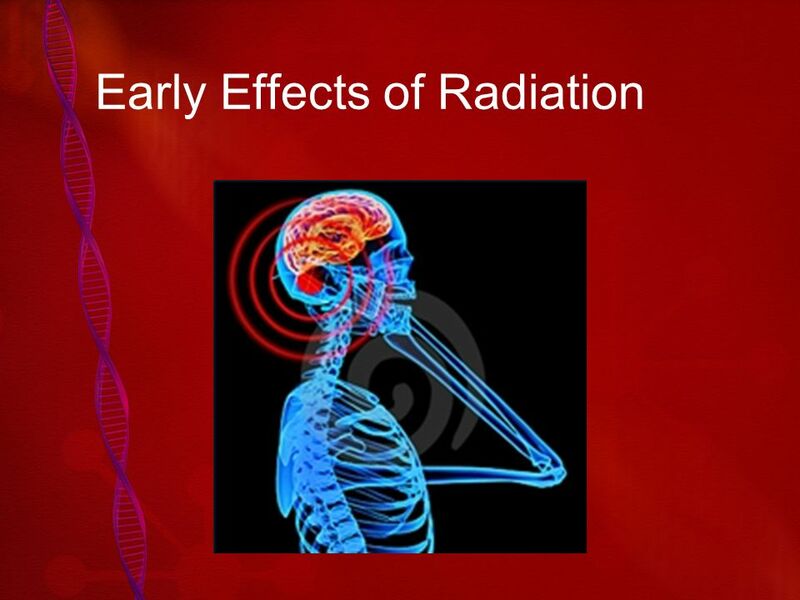 Download ppt "Early Effects of Radiation"
Radiation Biology. Radiation Safety Training Biological Effects Washington State University Radiation Safety Office. Injury/ Trauma Injury occurs when local stress or strain exceeds the ultimate strength of bones and/ or soft tissues. The rate of injury or tissue deformation. Eighth lecture. Radiation syndromes and stages in human A syndrome is a combination of symptoms resulting from a single cause and occurring together so. 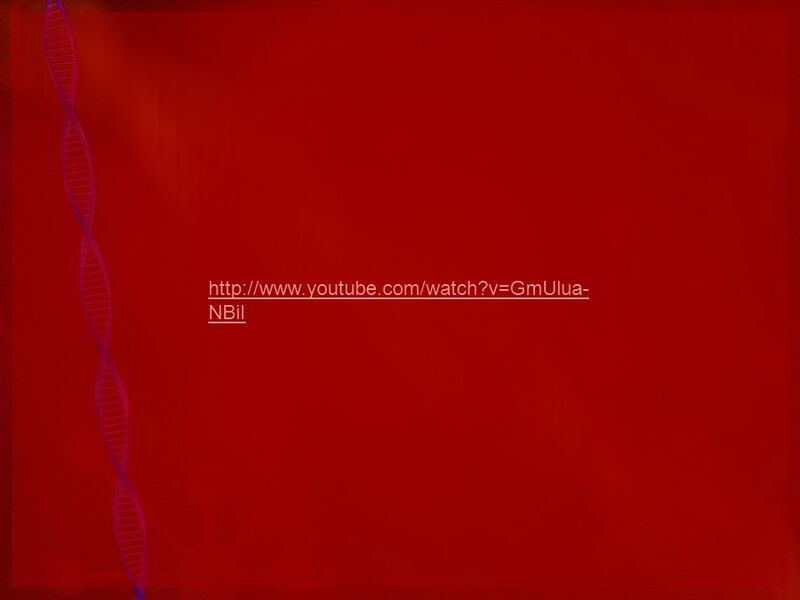 Whole Body Irradiation  Experience with bomb and powerplant incidents.  Experimental exposure of animals  Refers to complete irradiation of body –Particulate. 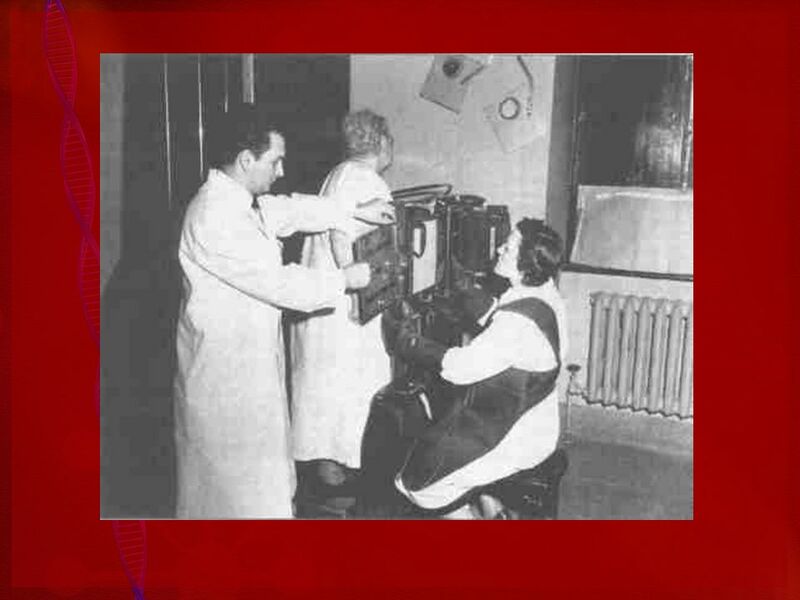 Studies of impact of ionizing radiation on the human body - Hiroshima - US-Japanese teams medical tests, autopsies, human organ analysis, on-site radioactivity. Acute Radiation Syndrome. Acute Radiation Syndrome (ARS) ARS, or radiation sickness, occurs in humans after whole-body reception of large doses of ionizing. Hyperglycaemia Diabetes Outreach (August 2011). 2 Hyperglycaemia Learning objectives >Can state what hyperglycaemia is >Is aware of the short term and. ANTHRAX By: Justin Tursellino. Anthrax is a…. Anthrax is an infection caused by a bacterium, Bacillus anthracis. The infection can take three forms depending. 1 Module 4 Signs and Symptoms. 2 Situation Assessment Known information regarding the chemical release Recognition of the event based on signs and symptoms. About Swine Flu Dr.Kedar Karki. What is Swine Influenza? Swine Influenza (swine flu) is a respiratory disease of pigs caused by type A influenza virus.